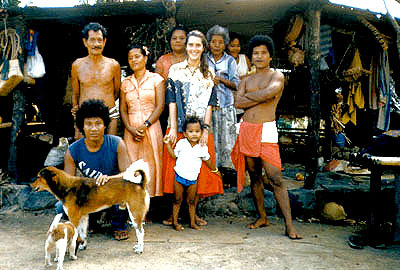 This is a photograph of me with my Yapese family in 1989. When I returned this summer, my family threw a party to honor me. They reminded me that this was my home, my village and my people. This was the place where I learned to appreciate the richness of a different culture with different traditions. This was the place where I learned different didn't mean inferior. People looked, thought, spoke and ate differently from me. Yet beyond all the external differences, I discovered a common bond. Friendship. Ten years ago this month Kansas City Star photographer Francine Orr arrived on the tiny Western Pacific island of Yap to begin her service as a Peace Corps volunteer. Francine grew up in the suburbs of Denver and knew next to nothing about Yap. But she knew she wanted to make a difference in the world. She wanted to serve. And Yap was where fate decided she would go to serve. Yap is one of the four states in the Federated States of Micronesia. It is north of the equator, in the western Pacific, south of Guam and east of the Philippines. Last month Francine returned to Yap for the first time since she finished her term in the Peace Corps, eight years ago. Some of the children she'd taught English were graduating from high school. Some of the older people she'd been close to were becoming frail. She wanted to reconnect with her Yap friends and "family" while they were all still alive and still remembered her. The Star asked Francine to document her return to Yap in the way she does best -- in photographs. The Peace Corps placed me in the village of Betchiyal, in Ma'ap (pronounced mop) municipality, on Yap proper. After six weeks of language training, I could say "thank you," "excuse me," "I like fish" and "there are a lot of mosquitoes." Waiting for me when I arrived was Tamag. He became my friend, chief, boss, protector and sponsor "father." I had never seen anyone who looked like him. He was sitting on a bamboo bench, next to his large basket. He was thin and wore a thu, which is something like a loincloth, with hibiscus fibers wrapped around the cloth. No shirt. No shoes. He had curly black hair, a black mustache, a muscular build and brown skin. He sat smashing betel nut with a piece of metal into a small cup. He scooped the betel nut into his mouth and chewed it. He didn't have very many teeth, and those he had were black from chewing betel nut. I greeted him with "kamagar", which means "thank you," a typical approach on Yap. I sat on the bamboo bench across from him, wearing a skirt, a blouse and zoris (sandals), with my small basket next to my backpack that contained all the personal belongings I'd brought from Denver. My friend Tamag is dedicated to the preservation of traditional Yapese culture. He wants to teach the youth what he knows before he dies and the information is lost. Click here for more photos. Tamag is a navigator and canoe builder, deeply rooted in Yapese tradition. He speaks both Yapese and Japanese. One of my jobs as a volunteer in his village was to help him with his project, the Betchiyal Cultural Center. My job was to assist him, to obtain grant money for the project, to advise him. Yet I didn't speak his language. I didn't understand his culture. I was under 30 and female. In Yap tradition, a young woman would never give a chief advice. During my time on Yap, I struggled with the language, struggled with my health and struggled with my role. Yet through it all, Tamag was patient and kind. It was then time to walk to Betchiyal. Tamag stood, holding his basket, and I followed behind him. The path was white sand, with palm trees and stone money on either side. Small children peered out from behind trees to glimpse the new volunteer and then quickly retreated. No one spoke. We walked through the villages of Wanad and Tarou, up and down a hill, over an old stone path, across a small wooden bridge and then into the village of Betchiyal. I could see people waiting for me, near the kitchen, a structure made of wood, with tin on the roof and two side walls. The other sides were left open. There were about 20 people, including women and small children running around, and dogs and chickens. I sat and drank a coconut while people looked at me. This was to be my home for more than two years. In this place I learned to appreciate the richness of a different culture with different traditions. This is the place where I learned different didn't mean inferior. People looked, spoke and ate different from me. Yet beyond all the differences, I discovered a common human bond. Friendship. Monday, May 18, 1998 5:30 a.m.
Up this morning at 4:00 am. I am sitting at KCI waiting for my flight. What was I thinking when I said I wanted to go back to Yap? Was this a mistake? Wednesday, May 20, 1998 5:30 a.m.
Up at 3:00 a.m. local time. I've lost track of time. I waited two hours for the flight out of KCI. Then flew to Houston, Tex. On to Hawaii, which took about nine hours. I transferred in Hawaii and then on to Guam, which took another seven hours. I arrived in Guam and spent the night. Up again at 3:00 a.m. local time, to wait yet again for the flight into Yap. One way from Kansas City is 8,088 miles. I don't know what day it is now in Kansas City. As I was running to catch my flight out of Hawaii, I passed someone speaking Yapese. I slowed down to listen. It turns out that four people on the flight were returning to Yap. We ended up on the same flight, and stayed at the same hotel. They had been in the states for a computer conference. It was great to see a familiar face. I was surprised they remembered me. I decided to start practicing my Yapese. I was talking to the daughter of one of the Yapese men. I asked her if she had drank her "shower". I had intended to ask her if she had drank her milk. (We were waiting for our flight into Yap.) I guess my Yapese needs some work. We all laughed. I feel like I am returning to something familiar. I had been questioning my desire to return to Yap. It was such a long journey. It has been almost eight years since I left. But then I heard Yapese, and laughed. Yap has had such a profound effect on my life. This little island in the western Pacific. There are times I never think of the place. Then, there are times I think of my friends there everyday. This past year I have longed to return to photograph this place. This was a place of growth for me. It was also a place that challenged and frustrated me. The frustration came in trying to understand another language and culture. In retrospect, that is where the growth came from. Yap is where I tried to became more observant. Tried to learn to be more patient. At times it was just plain fun doing something different. I don't want to idealize the place. It was difficult being so far from my family and friends. Sometimes I was sick. Mostly I was frustrated I couldn't do more. Life moves at a different pace there -- "Yapese time". With the joy of being a member of a community, so went privacy. Americans are accustomed to their privacy. Yap was my first experience living abroad. It is hard for me to remember why I joined the Peace Corps ten years ago this month. I think it may have been the desire to serve. Also, there was my desire for an adventure. I had imagined working as a Peace Corps Volunteer and helping to feed people. And I ended up on an island? I stayed for much different reasons and ended up working on a very different type of project. What I gained was much more then I could ever give there. I worked on a culture project. I had grown up in the suburbs of Denver. I found myself in a traditional Yapese village, on an island I had never heard of. The style of dress, food, the weather, language, customs, even the color of the people's teeth -- everything was so different. I had been placed in a village to advise a chief on his cultural project. Yet I didn't know the language, much less anything about the culture. I was also a teacher three days a week. I often questioned how effective I was at either job. The students would teach me as I attempted to teach them. Often, my head hurt from trying to study the language. After more than a year, my language started to improve. By then end of the second year I really enjoyed speaking simple Yapese. More then any of the work I did there, I valued the friendships. I have miss my friends there, and I am interested in seeing them again. Beyond cultural understanding, or language - the friendships above all, is why I stayed. Friendship is why I am returning. The airplane is moving now. We are about to take off for Yap from Guam. It is about an hour away. I think Yap is about 500 miles southwest of Guam. I am nervous. Will people remember me? How will I do with the language? What about the drought and the weather? Will I get sick? So many questions. My largest regret in spending time as a volunteer, is that I was away from my family. My second regret was that I was away from my friends in the United States. For as much as I gained there, I lost in time with them. I missed weddings, funerals, and births. It is ironic. My mind was blank while flying from KCI to Guam. After seeing a few Yapese in Hawaii, I am again excited about this trip. I heard a gecko (small lizard) last night. They make a clicking sound. Some of the old Yapese people say the geckos can talk. I hadn't heard a gecko speak to me for years. I laughed to the familiar sound. I've been here all day! Looking around, visiting old friends, making arrangements to travel to Mogmog. I had to go to Madrich to get the permit to travel to Mogmog. I sat here and explained that our World War II veterans in Kansas City asked me to try to go to Mogmog and take photos. This would be a good weekend because it is time for the elementary school graduation. I was able to get permission from the chief of Mogmog to travel there. Now I need to make flight arrangements to Ulithi. Once on the island I will need to get permission to take photographs there. Because I was a Peace Corps member before, I will be expected to follow the local customs. "You are soooooo fat! No, really you are really big now!" That is what I hear repeated to me, of course, with a smile on people's faces when they say it. Then they laugh. Everyone I meet -- "Hey your FAT!" I also know that in this culture that comment isn't rude or mean. In fact, from some people, it is a compliment. Basically, it became my way of introducing myself: "Hey, you probubly don't recognize me now that I am so fat." Then we would laugh and they would agree. Someone even said I was so fat I probably wouldn't fit in their car with their family, and then they laughed again. I am so happy that I can bring joy to these people. Others told me that they liked me when I was too skinny. This was a major source of entertainment for people. There is so much for me to do -- my mind is racing. I have not slept well for days. I have laid down for the past twenty minutes and I keep thinking in Yapese. I remember more than I expected, but it is more difficult for me to speak it. I know I should sleep now. I ate Yapese food for the first time -- Sashimi, tapioca, and boiled banana. I loved the cold coconut. I was given "nunuws" (flower lays) as I arrived at the airport. This is custom. The sweet smell of flowers around my neck, and the sweet smell of betelnut, brings me back. The warmth of the air embraced me as I exited the airplane, and I was instantly covered with perspiration. My Yapese sister, Joan, met me at the airport. She placed the flowers around my neck, and said, "There is no place like home." Indeed, there is no place like Yap! The children I knew before are now grown. The first comment from everyone is "Your're so fat!," and then they smile. They follow it by saying "You are really, really big now!" This is not an insult in Yap. I am so glad my weight could please them, because it doesn't please me. All of my apprehension of returning is gone. I feel good about this trip. It is a great gift to be able to return to this place. I am a bit older, a bit fatter. I wonder: When will I sleep? Today is my first day back. Had a quiet day yesterday visiting old friends around Colonia. I saw my old Peace Corps boss, John Mootmag, and his assistant, Augustino Sanemai, who went to Park College. Augustino has taken an early retirement from a government job. He now has a small store in Madrich, just outside of Colonia. He sells items such as shampoo, Spam, cigarettes and batteries. His retirement is part of the FSM government downsizing. I went to bed at 10:00 p.m., and was up at 6:00 a.m. I am sitting outside listening to the roosters as they run around the house. I can hear the stirrings of people waking up. It is very quiet. The air is still. Today I will go to work with Steve at the legislature. He is the young lawyer from Kansas City. Later I will go to Ma'ap to visit Fathlee. She is 75 years old. Most of my day yesterday was spent getting permission to go to Mogmog. I have been told my flight to Ulithi has been arranged. Haven't taken many photos yet. I did photograph Steve playing basketball after his workday, with some neighbors. The hoop is attached to a coconut tree. Both Steve and his fiancee, Leigh Urhuhn, spend time with their neighbors each day after work. You can often find them playing with the neighborhood children, or just talking with the neighbors. I am looking forward to visiting Maap soon. I want to go to a special church service on Saturday in Maap. It is a service for the elders and for the sick. That is a special place to me. The walls are made of cracked cement. There is no glass in the windows, and there is no door. The roof is rusted tin. Everyone sits on the floor. Dogs sometimes wonder in and out. Yet it is beautiful to me. Not for the structure, but for the community. People sit for hours both before and after the service. They sit, tell stories and laugh. Some people wear western clothing there, others wear traditional Yapese clothing. This was my favorite place to go with Fathlee, because I got to hang out with the old people and the kids. They were generally patient with my slow application of their language and numerous questions. This day was better then I could have imagined. I visited my best friend. I walked to the legislature office after watching Steve and Leigh riding their bikes to work. I photographed Steve at work. His desk is surrounded by law books. A computer sits on his desk. He is very happy to be in Yap. Tomorrow I will attend a legislative meeting in the morning. Wow, things have changed in Colonia . The old Yap Co-op Association is gone, and a huge building has replaced it. It is two stories high, made out of cement. There are many new buildings, and the road to Ma'ap is paved. When I was here it was difficult to travel from town to Ma'ap at times because of the road -- particularly during the rainy season. The bus would get stuck in the mud and we would have to walk through the mud. This was no easy task, barefoot, sinking in mud up to your knee, carrying groceries. Still, other times it felt as if the bus was going to slide off the road. No one ever spoke on the bus. People would just sit quietly. Everywhere I go people stop, look at me, and tell me how fat I am. Yet when I was here before, everyone told me how thin I was. I have finally resorted to telling them I will have to return at least one more time. On that visit, my weight will be just right. People laugh. Yapese have a great sense of humor. In Ma'ap, the sea breeze keeps the coastal villages cool. I had forgotten about the small footbridge you must cross before you enter the village of Wanad. The bridge is made up of several wooden logs placed over a stream. As I made my way to my village, I stopped at many houses along the way. I visited old friends and was delighted to see them again. We laughed together and chewed betelnut. I explained were I came from, why I returned, and where I was going. Typical Yapese conversation. It is respectful and appreciated. I made my way down the path that I had walked on every day when I lived here before. The very path I first walked on to my village. It was still quiet, still beautiful. I would stop at each house, sit on the ground, rest, talk and laugh. I finally made my way to where Buthung was staying. She was my Yapese grandmother. She is very old and frail now. She is in her mid 80s. She has a few tattoos on her arms and legs and wears a skirt with no blouse. She gets hot. I sat on the ground, looking up to her. She was about three feet higher then me, sitting in a small thatched house about twenty feet from the beach. She likes it there because of the wind. It keep her cool. She pounded her betelnut because she has lost her teeth. She has large holes in her ears. (Many of the old people have large holes in their ear lobes. People often wore flowers in the holes in their ears. The term old person, or elder, is a term of affection. A term of respect.) She is one of my old people. When she saw me, she laughed. I put my camera bag on the sand, and reached in to hug her. She put her cheek to mine, and sniffed. Again she laughed. Buthung has a wonderful sense of humor. She puts her head back and closes her eyes when she laughs. I had wanted to hold off taking people photos at first. I didn't want to be rude. But I couldn't help it. There she was. There I was. It was such a lovely moment. She remembered me. She would sometimes stay in Bechiyal when I lived there. She would continually try to make me laugh. She understood that I didn't know the language or culture, especially when I first arrived. So she used humor to communicate with me. Once I taught her the phrase "Hey, big nose, you want to buy a handicraft." She new it was a joke, and would only say it to me. Once, in the evening, many of us were sitting on the sand next to a lantern in Bechiyal. She ordered on of the girls to get her a bra and put it on her. I don't remember seeing her wearing a bra. Everyone waited as she attempted to put it on. The event was done to make me laugh. We all did. In traditional Yapese custom women do not wear shirts. This was an adjustment coming from the states. I came to realize that Yapese women are very modest. They cover themselves from above the waist, to below the knee. This area must not be shown, and it is always covered. Traditionally women wore grass skirts. Not made of grass, but of leaves or hybiscus. Long ago, where would people get shirts? The style of dress is still a part of who they are. Outsiders have come in and educated them they should cover their bodies. Yet is is hot, and for women it is a matter of function not to wear shirts. Younger Yapese women wear more western clothing like t-shirts and skirts, and now even jeans. Women from Yap proper wear shirts particularly in town. Traditionally men wore "thus" or loincloths. This is more typically seen in some of the villages now, on Yap Proper. Outter Island men can be seen wearing colorful thus in town. Typically blue in color, and sometimes white, or even red cloth is used. The men look handsome in their thus, almost like rosters feathers. Today, generally in town men wear shorts and t-shirts. Both women and men wear "zoris" or thongs on their feet. Female tourist are expected not wear bikinis, and they are also expected to cover their upper legs. This is custom, and not to follow this is very insulting to the people. Generally people will not say anything, but it is not acceptable to reveal your upper legs. Each culture has it's own cultural norms. Then I saw Fathlee. She was walking toward me. With a long wooden stick to give her support in one hand, and her basket in the other hand, she approached slowly. She was thinner then before and hunched-over. I stood up and walked to her. Tears welled up in her eyes, and we embraced. She told me in Yapese that she thought she would never see me again. She is my best friend. We walked together, holding hands, back to where Buthung was sitting. No one said a word. We sat together, and again she grabbed me and held me. She cried. We haven't seen each other for eight years. She then asked me how my family was. She reached into her basket and pulled out a photograph of me. She was showing me that she had not forgotten. I have a photograph of her hanging on the wall of my home. Later, we drank coconuts and laughed in each other's company. Then it was time to walk to my village. Joleen, my Yapese niece, and I walked along the shore. It was low tide. Chickens ran around us, the white sand under my feet felt right, and there was a slight breeze. We arrived in Bechiyal and I saw John Tamag. I knew it wasn't appropriate, but I hugged him. This was my village. This was my home. Then the phone rang. The phone? There was no phone, no road, no electricity to the village when I lived there. Here an old Yapese navigator was talking on the phone in the village. I was surprised at the changes. I felt like an old woman remembering her youth. Tamag sat, smashing his betelnut, while sitting next to his basket. The community house was damaged a few years ago by a typhoon. Tamag is overseeing the reconstruction of it. He is well known for his traditional skills. Even more interesting, he is willing to share his knowledge. He is very unusual here. He wants young men to learn from him before he dies so the knowledge is not lost. He is teaching them how to construct the community house in the traditional way. Even the rope that is used to tie the logs and bamboo together is hand-made. Tamag has sailed to Japan in a canoe. When I lived in Yap, he would told us stories of his journey. The kitchen would be illuminated by the lantern. He will return to Japan this summer, to build another canoe. He speaks both Yapese, and Japanese. He is my cultural hero. Tamag's grandson, Falan, was the little boy in the village when I was here last time. Falan would sit on my lap or hang onto my skirt with one hand and have his thumb in his mouth. I saw him take his first steps as a child. I loved him. He would have been about 2 and 3 when I lived there. Today he is 11 years old and has just finished the fourth grade. He has the same eyes and the same curly black hair. He has grown up. Of course, he doesn't remember me and he is a bit shy around me. I am delighted to see him again. I feel like his old aunt wanting to grab his check and ask him "So, do you like school, or what grade are you in now." I followed Tamag past the family house to the "Peebay" or community house. A lot has changed. The family kitchen has moved, and a few houses are no longer there. The house I lived in is still there. I watched the men work on the "Peebay." Mostly I just watched. I later returned to the kitchen, to see my Yapese sister Layan fed her baby. As it grew dark, Tamag returned and the lanterns were lit. I went to sleep about 8:00 p.m. because I was so tired. I started the day at the Yap State Legislature. The senators represent each of the ten municipalities of Yap, and the outer islands of Yap State. The major topic of discussion for this meeting of the Yap State Legislature was assistance being provided by the Federal Emergency Management Agency because of the drought. AUDIO: FEMA representative Bob Fenton talks about the drought. The Senators wear T-shirts, shorts and zoris. Each carries his own basket and has his own trash can to spit in. The basket sits next to the trash can on the floor. The tables are put together in a horse shoe shape, and a model of a Yapese canoe hangs from the ceiling. The tabletops have piles of notebooks, and papers. Many of these men have studied law in the United States, and they are highly educated. The major topic for this meeting was assistance being provided by the Federal Emergency Management Agency because of the drought. El Nino has hurt Yap State. Coconuts are small and brown. There is little betelnut, and the drought has been devastating to the taro, which is the staple of the Yapese diet. Even if it were to rain today, there has been much damage done to the traditional crops. It will take years for the taro to grow back. In Colonia, they have water hours. Every other day there is water for a few hours in the evening. The outer islands have been particularly hard-hit. There is little drinking water. In some islands, the sea water is coming up into the drinking water. The sea water is also killing the taro. Fresh water must be brought by ship to some of the outer islands. I saw my Yapese brother Giligoofager. We had lunch. He has a new wife now, and she is lovely. They have three kids. He looks the same. The same red smile. I enjoy getting up early and sitting outside. The sounds awakens me about 5:30 each morning. I can see four dogs on the road. They are slowly rising, stretching, and rolling around. The breeze is very calm today, so the flies are crawling around on my legs. I love being outside here. I hope to then get to church with Fathlee. I just want to sit next to her. Tomorrow I hope to go to Rumung, a separate island close to Ma'ap. It is still a part of Yap. Outsiders are not welcome there. There are people from Yap proper who have never been there. I hope to go for an all-day picnic, on Sunday. I went to Rumung to look around a bit today. I saw an ancient stone footpath. I have no idea how these stones were cut and moved. The stones were smooth and dark gray in color. Some stones were no larger than a foot, and others perhaps five feet wide. The stones were large enough to expand over a small stream. The large stones were bridges. The stones lined the stream beds. I knew I was looking at a very old art form -- a Yapese stone path. We went to Bechiyal to enjoy a picnic of taro, fish, and roasted chicken over a fire on the beach near the men's house. Later, I went to church with Fathlee. I arrived as the church bell was ringing. Everyone was already inside, sitting on the floor. All of the old people on the right side, and all the others on the left. I went up the center aisle to sit next to Fith, who was with the elders. This was a special service for the elders and for the sick. This was something I hadn't seen before. It lasted for hours. It was so familiar to sit on that cement floor, inside that church.There is no glass for the windows. Everyone sits on the floor, or on hand-woven mats. I love this place. This is the place I dreamed of returning. This is the feeling, sitting next to the elders I have longed for. I took photos after church as we sat together. Some women wore grass skirts, some old men wore thus. Others wore skirts, shorts and shirts that were evidence of the Western influence. After church I saw one of my old students. I taught her in both first and second grades. She speaks English now. She was a dear child, and now she is a lovely young woman. I was proud she still remembered me. I then returned to Bechiyal and later Colonia by boat. How I love the water. The colors change as the boat skims the surface. Various blues, greens, and blacks. While traveling in the channel, the water is calm. The clouds reflect off the surface like a mirror. You can see the white light sparkle off the tips of the tiny waves, and just underneath it is pure black. I had forgotten how many stars you can see at night here. They fill the night air. They extend down, all the way to the horizon. I particularly enjoy a full moon here. It is so bright, the trees cast shadows onto the sand in the village. One does not need a flashlight to see. I missed the full moon on this trip. I will go to Rumung today. This place is more remote then the rest of Yap proper. It is not connected by a road, and during low tide you can almost walk there. But the people there keep to themselves more. There is no electricity, no phone. It is fun for me to visit because I know it is an honor to be allowed to go there. I went to Rumung by boat. We had a beach picnic. I have never been to this place. There's a white sandy beach from which you can sit and look out to the horizon. We had chicken, hot dogs, turkey tails and fish, all of which were barbecued over coconut husks. We sat on the beach under the shadows of the palms. We talked and laughed. I later swam with the kids, laughed and played. In the evening the tide returned, and the water was warm. We swam again. Ethnobiologist Margie Falanruw Cushing told me about the effects of the drought on Yap, which has been her home for more than 25 years. I spent the day with Margie Falanruw Cushing, an ethnobiologist who has lived in Yap for more than 25 years. She is a lovely person. She is from Guam but has a Yapese family. She is a wife, a mother and a scientist. She cares about her family and about her work. Today is her mother's birthday, so we offered a toast to her with our mango juice during a lunch of Ramen noodles. We drove around Yap, talking together about the damage caused by drought. We finished the day sitting near a special tree as the sun set. People used this tree to rest under its branches long ago. She stood golden in that light. That type of tree is what traditional canoes are made from. People use the trunk of the tree for the beams to support the large community houses. This is where I photographed her. I visited the Department of Education building today. I am amazed with the changes. The high school students made a CD-ROM about traditional Yapese culture. Students will be able to exchange information from their homes using the Internet. They will be able to send e-mail to friends and family. When there is a typhoon here, family members in the United States will be able to check on the well-being of their Yapese families. There is an air of excitement over the possibilities of exchange. Today, I will go to work with Leigh, and to the workplace of Theresa Kreif, 22, a Peace Corps volunteer from Wichita, Kan. I want to photograph Steve surfing, also. My left foot remains very swollen. Perhaps it is a very mild infection. Or perhaps it is nothing at all. My Yapese grandmother Firetin (Spell) keeps putting traditional medicine on it at night, and then she sends me to bed very early. I tell her it is fine and I would like to stay up, but she insists. I am not able to say no to her. Life moves slower here than in Kansas City. People listen more and react slower. With my limited time here, I worry about how much I can accomplish. I am still trying to do several assignments a day. I have set my own goals. This first week I am staying in town. Next week I will go to Mogmog, and the last week I will spend in Ma'ap. Words are not spoken at times because feelings are understood. I have respect for these people. They work hard. Some care very deeply about their culture. I know the time with them is a gift for me. Sometimes I wonder what type of teacher I was. I didn't speak Yapese well, particularly at the beginning. I didn't have many teaching tools. But I did have love for my students. Coming back, and seeing them again: Wow, what a gift. They were babies before. My little students are teenager now. One of my students even has a child of her own. Steve takes a break from his work with the Yap State Legislature to share lunch with his fiance, Leigh. I ran out of energy to write yesterday. I went to work with Leigh yesterday and photographed her having lunch. She enjoys having lunch with Steve, and then she reads her book while sitting on a bamboo bench near the water. Time for me is running together. I am trying to arrange meetings and photo sessions. Today, I went scuba diving. This is the place I learned to dive. The water is clear and warm. I went diving in a shirt and long shorts. Again, it is the custom not to show the upper legs. The water is so warm, a wet suit is not needed. I saw a number of sharks and great numbers of multi-colored reef fish. There is a variety of corals -- finger coral, brain coral and coral that looks like leafs. I could hear myself breathing hard during my first dive. I haven't been diving for a while, so it wasn't until the second dive that I began to feel at ease. The manta rays are a big attraction for scuba divers in Yap. This one was huge and swam directly over me. I kept looking around for the manta rays. I saw a number of them on the second dive. They are beautiful and graceful. They are huge, and they swim over your head. One might imagine the manta rays are like UFO's floating overhead. I sat and waited on the sandy bottom of the channel, about 45 feet under, and waited for them to arrive. I looked up toward the surface, waiting with my little camera. On the way back I sat at the bow of the boat looking out onto the water. Shades of blues, greens, blacks -- small fish jump ahead of the boat. I purchased my Mogmog supplies. Noodles, canned tuna, ship biscuits and water. I will stay with a family when I am there. For them I purchased coffee, sugar, cream and cookies for the kids. I also brought a few children's books. When you stay with a family, this is what you must do. There are no stores there. A visitor is expected to bring enough food for themselves and for the family. There is also the toll, much like you would pay a toll from Kansas City to Lawrence, to bring cigarettes for the chief, which he then divides with rest of the community. As people passed me by, the cigarettes disappeared one pack at a time. By the time I got to the chief, I had nothing left. Perhaps he thought I was rude. There is a drought. I don't know how much drinking water there is in Mogmog. I can not depend on others for food or water there. No store, no convenience store. I will wear a Lava lava there. There is some question if I will be able to wear a shirt there. On a few of the islands, Western clothing is not allowed. I don't know about Mogmog. Fretin weaved a basket while listening to an American commercial on television. She was confused about basketball and wanted to know more about it. I am sitting in Colonia, watching television. I think it is so odd to be watching shows that have been taped in California. One minute I am in the village, sitting next to a lantern or watching a community house being built, and then the next I am watching American television with American commercials. This evening I watched the show "Friends" with the kids. I then watched part of the movie called "Killing Time." I also found the title ironic. My Yapese grandmother Fretin sits near the TV set and weaves a basket. Weaving is a typical pasttime for Yapese women. She doesn't understand English, but she sits on the floor and watches television with the family. She was asking me about basketball. What kind of game is it? Why do they run back and forth? She wanted to know if I played this game. I wonder what she thinks? It has started to rain a little at night. The rain comes in waves, and the sound pounds through the tin roof. It doesn't last long, and I am happy it is beginning to rain. It is good for the land. I'm flying to Ulithi in a Queen Air Beach Craft. (I returned on a 1957 Beachcraft) Including the pilot and co-pilot, there are 10 people aboard. It is so hot, it is difficult to grasp the pen because of the perspiration on my hands. I am the only woman aboard. Some of the men are wearing thus. Others are wearing T-shirts and shorts. I am wearing a Lava-lava tied on with a rope. I have a safety pin attached to the rope and the material so the material doesn't fall down. I have a sleeveless shirt on and zoris. It is difficult to keep the Lava lava on because I am not accustomed to wearing it. This is what is worn by women in the outer islands of Yap. It seems a tad cooler in the plane now. It is easier to hold the pen. I do ask, when I arrive in Mogmog, if I will need to remove my shirt. Another Peace Corps volunteer told me just this morning I would have to, because this is a more traditional place. An aerial view of Falalop, Ulithi, clearly shows the airstrip where I landed. From Falalop, I took a boat to Mogmog. Landed safely in Falalop, Ulithi. There is some confusion about who will take me by boat to Mogmog. I have no idea who I will stay with. I will try to return on Sunday to talk to someone about a hotel being constructed in the hopes of attracting U.S. veterans of World War II. Still having a problem with the Lava lava. All the men are sitting away from me. I am still the only female, and I am sitting alone. It's beautiful and quiet. I can hear people talking. The water is lapping on the shore and there is a slight breeze. I think I will look for my sun block. In Mogmog, Western-influenced clothing is not permitted. A PCV warned me, but it wasn't until the small boat was approaching the island that I realized that I would have to remove my shirt. I have traveled to the outer islands before, after spending years on Yap proper. I'd become used to the custom. Yet, having lived in the United States for the past eight years, this time it was a bit more of a shock. I was actually more worried about my camera equipment. A large wave hit us, and my flash got wet. It is not working now. The engine stopped, and the men needed to change the gas tanks. Meanwhile the water was rushing in the small hole of the boat. They were trying to plug the holes. I just sat, imagining my cameras and film sinking. The boat soon started, and we were on our way. Someone aboard said, "I guess that was an experience for you." In fact, it was. The ride from Falalup to Mogmog took about 40 minutes. It is very hot, and there is very little wind. I love to pour water over my head and let it roll down my skin to clean and cool myself. I have very basic concerns: Where is the restroom? The shower? Where will I sleep? Sit? Last night I slept in a tin house with two other women. I feel safer staying with people, and I don't want to be by myself. Slept on a mat on the floor, and used a fresh roll of toilet paper as my pillow. I wanted to take photos last night, but there was no light, and my flash wasn't working. I wished the moon had been full. Even with just my eyes, I had problems seeing because it was so dark. I was awakened at 3:30 a.m. by the silence of the place. After a while, I could hear a baby crying in the distance, but only briefly. With out a breeze, it is so hot in the tin house, I couldn't sleep. It is 6:30 a.m. and I can hear people moving about, making food and baskets for graduation. Chickens are running around, children are playing and women are cooking. These are the sounds of the morning. I am so frustrated with my Lava lava! I have had such a difficult time keeping it on correctly. I don't know how to sit properly in it. As I perspire it sticks to my legs, and then when I begin to walk, it inches up. This is so frustrating! I cannot and should not show my legs here. I am just not used to wearing it. As for the no shirt thing, I just don't look down. And I don't think about it. I am more concerned about the Lava lava falling off when I stand up. I am not comfortable wearing it. I should have been practicing waering it at my home, but I didn't think about it. Wearing it well is an art form, I think. People have been very kind. I just worry that if a storm should come, I will not be able to get back to Falalup, and then back to Yap. I need time to work on my other stories. This was a risk. I have no idea how I am going to get off this island. I wanted to come during this season, hoping to avoid storms. I think I will be fine. God, I am so sunburned and frustrated. Certainly, I appreciate being here, but I wish I could just relax. Last night I slept in the canoe house about 20 feet from the shore. It was so pleasant. The breeze was lovely. It was so much better then trying to sleep in the tin house. I even needed a sheet to cover up with! Now this was a cool experience! This was not the men's house but a place that women can also stay and enjoy the shade. I slept on a mat over the white sand and used my camera bag as my pillow this time. I stayed with others there, so I got a great night sleep. Ignasio Hapthey, chief of Mogmog, told me stories about the island's role in World War II. AUDIO: Interview with Mogmog's chief. Translation of the interview. I was able to interview the chief of Mogmog. I sat next to him as he told me a war story. He was great. I got to sit next to him, and this was unusual. His second language, and my second language, is Yapese. So the interview was in Yapese. He spoke of the young Ulithi princess who was killed during the war. He then asked me to go to the cemetary to look at the grave. The cross with her name on it is still there. I am frustrated because I feel like I am obligated to the deadlines I have set for myself. Our Western deadlines do not correspond with life here. Had I unlimited time, I would have been able to get more accomplished. I am so happy to be returning to Yap. As frustrating as it was trying to wear the lava-lava correctly, I loved Mogmog because of the differences from my own culture. If I had unlimited time to stay, I could have relaxed and enjoyed myself. But with my own pressures looming, I needed to get moving. I stayed in the priest house last night on Falalup, Ulithi. It was so great to be able to shower in private, and to drink cold water and relax a little bit. When I am in Kansas City, these are the things I take for granted. Father Nick is a friend of mine. He is related to the family I stayed with in Yap. He let me stay near the church. The cold drinking water was great. Father Nick has a refrigerator that was filled with wine bottles. Each bottle had cold, boiled water inside. I drank the boiled water straight from the wine bottles. He asked me not to drink his Mass wine. I didn't. I went though bottle after bottle because I was so hot. I spoke to John today about his veterans project. He had told me that there was to be a reunion for Ulithi veterans in Kansas City. I was thrilled. Then I looked at some of the paperwork and realized the reunion would be in Kentucky rather than Kansas City. I tried to explain the difference to him. He told me that I should just go to Kentucky anyway. I tried to explain the two states were far away from each other but I guess I didn't make myself clear. I'm sitting on an old airplane it is silver with a long nose -- a Beach Craft 1957. I have flown on this plane before, when I lived on Yap. A pilot asked me to go along with him and look out the window. There had been a ship lost at sea, and they needed people to help took for it. We flew back and forth, just hundreds of feet over the water, looking through the rain for signs of the ship. And we found it. I just had gone along for the ride. I am glad to be on this airplane again. The pilot will fly over Mogmog so that I can get a photograph of the island from the air. There are nine people aboard, including me. I wonder if they are afaid, flying in such an old plane? Everyone sat in silence. It is so good to be back on Yap. I have so much that I need to do. I came back and met with the governor and the lieutenant governor. At this moment I am sitting in the koyang, a locally made structure. The roof is made of hand-woven palms, and the roof is held up by local wood. There are no walls. It is a great way to enjoy the cool breeze. However, there is little breeze today. It looks as if it may rain. Joleen just went to get some mangoes. Joan is showering, and getting ready for work. Madel, the little girl, is carrying the baby basket her grandmother made her for her doll. When I lived in Yap, I sometimes stayed with Fathlee. She gave me food, cared for me when I was sick and shared her friendship with me. I've spent two nights at Fathlee's house. When I stay at her home, it is as if I were staying at my own grandmother's house. It just feels good to sit next to her. Our friendship transcends time, language, culture and a generation. Yet it is still very strong. She gave me food to eat when I was hungry; nursed me back to health when I had dengue fever. She helped me when I injured my ankle. She is my friend. Fathlee has a great since of humor, and she laughs a lot. Everyone should have a friend as dear. She was my gift when I lived here before, and she continues to be my gift now. She works hard. She takes care of her husband. His memory is failing. Each morning she rises at 4 or 5. She prepares the food for the day. She feeds the pig once in the morning and once in the evening. I tried to help her, but she didn't want my help. I didn't see her go the taro patch. Maybe she is too frail now. She enjoys listening to the international news translated into Yapese each night on the radio. She is very aware of international events. She also prays aloud each night. Sometimes my tears flow when I sit next to her. It is both of joy that I can see her, and of sadness that most likely I will never see her again. We are sitting in her kitchen drinking coffee out of peanut butter jars. I am writing as I wait for the hot coffee to cool. I am writing as she cooks. There is very little wind. I've not slept well. The air is still. I can't even hear the wind in the palms. Fathlee is thinner now, and more bent over. She still walks with her hands behind her back. Her left hand grasps her right wrist. She carries a smaller basket than in the past. I thank Fathlee for helping me so many years ago. She said never mind. She then said when it was near the time of her death, she would ask someone to call me so that I would know. I wish she would stop talking about her death. When I asked Fathlee if I could photograph her, she put on her grass skirt. She tried not to smile. I think she didn't want me to see her teeth, which have been stained red by betelnut. Yesterday she asked me if I wanted to take her photograph. She stood up and got her grass skirt, then returned. Two of her grandchildren were visiting. They tried to tickle her and make her laugh. She had tears in her eyes but she tried not to smile too much. I don't think she wanted to show her teeth. She allowed me to photograph her while cooking, resting, and feeding the pig. She shows her top red teeth when she smiles and then laughs. She has very kind eyes. Yesterday I visited with my friend Guper. She was making a grass skirt for graduation. We had a picnic near the beach -- sashimi and taro. It was lovely spending time with her again. I also saw Alukan, age 47, my Yapese brother. He also wanted me to photograph him. He went and changed his clothing, to the traditional man's thu. We have a good friendship, and an understanding that he is my brother. I treat him with respect, and he treats me with kindness. He is starting to get white hair. I was happy to see him again. In a while, I will go to the taro patch with Laafal. She is a friend. I have never been to her taro patch. It is an honor that she is taking me. The drought is killing the traditional crops such as taro. To allow me to take photographs there, especially now, is special. Women in Yap work in the taro patches. Woman garden, and men fish. The taro patch is usually swamp like and very muddy. With the lack of rain, it is dry. Generally I was afraid to go the the taro patch. In some of the taro patches, there are eels. I was afraid of being bitten. Mostly, I just didn't know what I was doing in the taro patch. I would stand with a machete but didn't know what to do. Each tree, each piece of land, is owned by someone. I wouldn't have the right to trespass on the land. Even the fish are owned by people. People get their names after birth, sometimes months after. The name is associated with the land. You are the land and the land is you. The location of the land determines your place in society. Each time you photograph someone, it is important to get permission. It would be the same if I would enter into a person's home in Kansas City. I would need to seek permission from the occupant. It rains a little at night now. People speak of the drought, and about El Nino, often. Fathlee is asleep on the porch now. She sleeps on the cement floor, next to her Bible and basket. I left Fathlee's house yesterday. I waited all day, working up the courage to walk away. Waiting for the courage to say goodbye. It was 5 p.m., and I needed to start walking before it got dark. I gathered up my things. She was very quite. I knew I was walking away for the last time. I was walking away from someone I loved. It is typical to tell someone in Yapese "I am going and I am coming back." Each conversation ends that way. I just stood and said I was leaving. I had to go to my village next, which is several villages away. Walking away from her was as if I was walking away from my own grandmother. She is so old now. It hurts. It still hurts. I choked on the word "Kafel" or goodbye. I turned away and cried, walking slowly away. I walked to Bechiyal. I have already visited a few times, but this time I would stay for a few nights. I am sitting next to Tamag. He is showing the men how to build "Peebay." Even the rope is hand-made. I would watch Tamag make rope by hand every evening when I lived here before. He rolls coconut fiber on his legs, adding piece by piece, until it becomes a long, strong rope. I can hear him pounding his betelnut. It is easier for him to chew it after he pounds it. He told me he is getting fitted for false teeth. I asked him if I can photograph him at the dentist office, but he just laughed at me. I guess the answer is no. I am just content sitting next to him. So, I've left Yap. I will start with yesterday. I've been staying in my village. I wasn't certain what type of welcome I would get. This was the place where I lived, and were I worked for more than two years. It is a beautiful place, a traditional place. There are three traditional structures -- the men's house, the family house and the community house. The community house is being rebuilt. It was damaged in a typhoon several years ago. Tamag is overseeing the reconstruction. Tamag is a man deeply rooted in tradition. He is a navigator, canoe builder, a grandfather, a chief and my friend. He has told us stories of sailing to Japan in a small canoe. Then, he told us stories of bravery. We would listen to him as we sat near the lantern. He would tell about how he stood on the roof of a tall building in Japan and looked down to the side walk. For him, that was and act of bravery. It made sense, he said, because he had never been higher then a coconut tree. Sailing across the open sea was second nature for him. But being in a city, well, that was something! Tamag was willing to share his knowledge. But he is getting a little older now. He is even wearing zori's now. He is the man behind the Bechiyal Cultural Center. That was our project. He wants there to be a place where people are welcome to visit and learn about Yapese culture. A place for both local people and tourists. He wants the Yapese traditions to continue. He doesn't want the traditions to die. He doesn't want the place to become a museum of the past. He dreams of the center, not as an amusment for outsiders but as a place of life. The village is where women care for their children, where they go to the garden, prepare food and weave baskets. It is a place where men catch fish, cut tuba ( a local drink), make rope and build houses and canoes. It is a place where children play, swim in the water and listen to their elders tell stories next to the kerosine lantern. The village is a place of learning, a place rooted in tradition and a place for the future. He wants the center to be a place for people to learn. I tended to hug people a lot during this visit. They responded in kind. It wasn't "culturally appropriate," but it seemed somehow appropriate between friends -- this time. Last night, the people in my village provided a family gathering. Women cooked all day to prepare for the event. I went off to graduation during the day to see my old school. Before the food was served, the family gathered around. Children, women and men fell silent. They began to listen to Tamag. He was about to start speaking. The gathering was a surprise, and it was in my honor. I was sitting on a white bucket about five feet from him. I realized what was happening and put my head down. I held my breath, and with all my strength I tried to hold back the tears. I couldn't. The tears streamed down my face and dripped onto the sand at my feet. I looked up and saw that he also was crying. This was the only time, except for a funeral in Yap, that I had seen adults cry. I was being honored by my Yapese family. I was thanked for my work before and for returning now. I was reminded that this was my family, my village, and I was welcome. It's funny, the human heart. Language, color, culture. All that doesn't matter. It's that purity of friendship that transcends all. I had a difficult time expressing what I wanted to say. I told him thank you. Told everyone thank you. Falan was the little boy who once sat on my lap. That same little boy I saw take his first steps walked over to me and placed a "nunuw" (or flower lay) over my head. He hadn't remembered me at first, but as the days went on Tamag would tell him stories that I had been the one who cared for him as a baby. He later let me be with him as he built a small boat. We had become friends again. Then Nifin, the mother of the house, with tears in her eyes, came to me in front of the family and thanked me. Then it was time to eat. When I lived in Yap before, I was at times sick, at times frustrated, at a loss with the language and culture. Yet my respect for Tamag, and what he was trying to do in preserving his traditions, kept me there. He, in part, is why I returned. I didn't realize this trip would be so emotional for me. Why would I cry now, after so many years? I'm older now, and have some distance, maybe a greater appreciation of the place. Seeing some of my students graduate was a joy. Leaving Fathlee's house was the most difficult thing for me. We didn't have to talk much when I was there. We just sat together, and enjoyed each other's company. The elders welcomed me to photograph them. They said it was good to take their picture, so when they die, their families will have that memory. This became a big responsibility. I went to the airport, and people came to say goodbye. They honored me with more "nunuws" and asked when I might return. Others thanked me for my visit. Words had already been spoken. Each of us knew how the other felt. There were no tears this time, only a few hugs and smiles, and it was time for me to get on the plane. I found it difficult to record my own experience. I am in the business of reporting other's stories. I hope my photos and words can reveal something of another culture. Something beyond the surface of differences: the story of friendship. People worry about their children in Yap, as we do in Kansas City. They are concerned for their future and concerned with keeping their traditional culture going. Still others are dealing with the same problems of alcohol and drug abuse that we deal with in our own communities. Youth suicide is an open wound for some. Yet, for as many differences in dress,superstitions, language, and culture, the value of friendship, of time spent together, is the same. Great story! Micro 90 rocks. Anyways hope that you will go back and visit sometimes. Just happened to surf upon your story. Ah...the simple pleasures of surfing the Net. Great reading as I celebrate the MLK holiday in the United States. Thanks for sharing a slice of your life... .
Kammagar, for sharing your poignant memories of Yap. For a little while you took me back home. Ah, the memories. Man nga mub, Francine (Go and come back). There are no good byes for a true Yapese at heart. The land and the people will always welcome you back. im just curious is there any village or place name lemwar in yap???????????????????????????????????????? I am doing an information search on Yap culture and was wondering if anyone out there knows the answer to this simple question. What do the people in Yap use for eating utensils when they eat? Do they use their hands/fingers? Do they use chopsticks or forks/spoons/knives? Do they use leaves to scoop their food. I would appreciate any input someone could give me. I really enjoy reading your returned trip to the isle of stone money. Felt as if I was watching a true and emotional story on tv--though I wish it never ends. Hmmm...such experience does not just happen over night rather requires initiative and time. Glad that you were able to taste the Yapese way of life. A small dot that made the world complete. Ah, such a sentimental, emotional and touching real life story of friendship and sense of belonging. I just wished that more people around the world could have a chance like you to live and experience a different part of the world and understand the difference in culture, but yet we are all part of the human race... and such will give us more understanding and tolerace of each other. Hope you are able to go back to Waap another day. By the way, do you have your photos of this trip posted on the web somewhere? A proud member of the backward group of Chuuk. I was touched by your story and it brought back alot of memories. I was just a little kid when first came to Yap and it was interesting to hear you talk about the old Yap. John Tamag was my grandfather and Fathlee was my grandmother. You did a good job on describing each of the person and even though we didnt met, youll be a dear person to my heart. And I wish you the very best in life. Kefel. This just remind me alot about back home. Thanks for the good thing that you talk about, and I'm sure every single person in yap really appreciate. After reading your story, it just make me want to go back home and see my family. It was nice to see your story. I still have the picture you took of me building a hut with a few yapese kids. Hope you recall me. Take care and nice to se what your doing. now that was some story. i am from yap, i now live in boise. not a lot of people can do what you did. that was some sacrifice. i appreciate all the good things you said about that island. Hi, It was nice to hear about your experiences and adventures in the island. I cant say that i am really related to your yapese family... But all i can say is, i am related to them through my uncle.... which, i dont know if you met him on your trip there? Don't know if this board is still active but will leave a message and hope. I met Francine during a holiday to Yap. I was hitchhiking to Ma'ap and we shared a cab for a few miles. The cab bogged down in the mud and we had to walk a few miles carrying her groceries. The path was through the jungle to her village. I have been looking at my photos of that trip and remember that day well. It was a privilege to get to meet her family and see the true Yapese culture.